Sayfamızda atatürk hayatı ingilizce kısa, atatürk hayatı ingilizce kısaca, atatürk hayatı ingilizce özet, atatürk hayatı ingilizce slayt, atatürk ingilizce hayatı ileilgili bilgiler yer almaktadır. Atatürk was born in Selanik in 1881. His father was Ali Rıza Efendi. His mother was Zübeyde Hanım. His parents called him Mustafa. His father , Ali Rıza Efendi died when little Mustafa started primary school, so they moved to another city. They stayed there with his uncle. Then, he went back to Selanik, and started Şemsi Efendi School again. Later, he entered the exam for the Military School and he passed it. He was very hardworking student. He finished the Military School and joined the army as a young officer. He fought in Çanakkale Wars. Then, He became the chief commander of the Turkish Independence War. He saved our country with his friends from the very strong nations of the world. And he overcomed them. Then, He invited the all Turkish patriots to Ankara on the "19th of March,1920". He opend the Turkish Grand National Assembly by a religious ceremony on the "23rd of April, 1920". Atatürk is founder of the Young Turkish Republic. He founded the Republic of Turkey on the "29th of October, 1923". And he became the first president of the Turkish republic. 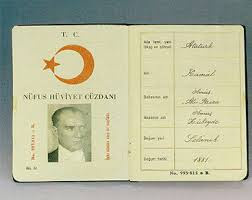 In 1934 The Turkish Grand National Assembly gave him the surname "Atatürk". Atatürk means the father of Turks in English language. He died on the "10th of November, 1938". His mausoleum is in Ankara. Ankara is the capital city of the Turkey. It's in the middle of Turkey.